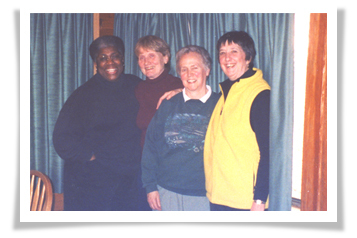 LOOKING BACK – A little over fourteen years ago now, a group of four women found themselves on a small committee with a mandate to find ways of promoting local talent while helping to raise funds for related Community Art projects or facilities. The original project was to raise community awareness of the, then brand new, Ridge Theatre at Claremont High School and to raise funds for the lighting and sound system at that theatre. The four women were, Louise Rose, Sue Coneys, Pat Robertson and Ella Jean Grundison. In the beginning we were able to secure the use of the Ridge Theatre on the last Friday of each month and we would facilitate concerts showcasing local talent. We called ourselves the ‘TGIF’ (Thank Goodness It’s Friday) group. What fun we had! We would get together for tea and muffins and plan how to fulfill our mandate. This city had and continues to have such a wealth of unknown talent with limited opportunities to be seen and heard. Some of those early shows gave audience to folks like Michael Kaeshammer, The Carson Kids, Pat Carfra, Louise Eldridge and Lebeau Peterson Trio. Many, many other individuals and groups shared their wonderful talents on those Friday nights. In the fall of 1996, we sat drinking tea and eating goodies in Sue Coneys’ kitchen, planning the upcoming season’s calendar for the monthly Friday night concerts. We often tried to find groups or individuals whose repertoire’ might best highlight or fit the season. Louise made the observation that Friday 28 March 1997 would be Good Friday. “Wouldn’t it be nice to have a gospel choir for that night,” she mused. “You know,” she said, “If there were about 30 or 40 people who would be interested in singing gospel music, I could create a program for that Good Friday”. It sounded like a possible solution! “Let’s go for it”, was the unanimous decision. “How to go for it? Well, let’s just place a little ad in the newspaper and see what response we get”, we said. It seemed like a plan! So, the ad was placed in the Times Colonist paper for interested people to meet on December 2nd at Allison Piano Studio on Government Street at 7pm for an information session. Having no idea what to expect, we arrived at the studio location to find traffic jams and a great long queue of people well out into the parking lot! “Had we made some mistake? Was there some event going on at the brewery (which was in the same general location) this night as well?”, we wondered. Something must be happening! Such an excited group it was! Heavens above!!! Something was happening all right! Yikes! Yes, all 326 people present had come to sign up the gospel choir! “No auditions! Louse’s only requirement then and to this day is only “that you want to sing”. The response was beyond her wildest dreams. It was beyond anything we were prepared for. Where could 326 practice? Where would we perform? The Ridge Theatre fire regulations only allowed for 85 people on stage and the audience seating would only accommodate 240 people. Not to be daunted, we began the search first for a facility to practice in and then a facility to perform in. Even the memorable snow falls of December 1996 were not to interfere with the search. Luck was on our side! We were able to secure the use of the sanctuary in Cordova Bay United Church for Tuesday night Choir rehearsals and the Good Friday Concert was staged on March 27th 1997 at the University Centre Auditorium. The concert was a resounding success and the Ridge Theatre had its lighting and sound system paid off. As for the TGIF committee, we expected this to be a one time affair. Good Friday came and went but the 300 plus folks who had come to sing gospel music had no intention of going away! They were ‘very loud’ and ‘very clear’. They expected we should find a way to have this great musical opportunity continue. Over the next months an expanded committee of people worked out a plan to continue. The Victoria Good News Choir began its first full season in September 1997. It has been ten years of changes and growing but some things have remained constant. The joy of singing wonderful music, an on going community of friendships, generous sharing and much love and laughter! The catalyst for it all is Louise Rose. What a blessed group we have been!! Blessed indeed! The Victoria Good News Choir has taken on a Life of its Own.